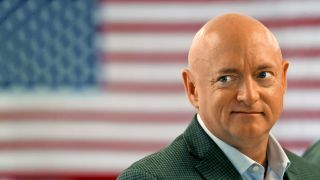 Former NASA astronaut Mark Kelly will run for the U.S. Senate in Arizona's special election in 2020. Kelly, a Democrat, announced his campaign in a video on Twitter in which he spoke about his family, his career and the policy issues that drive him the most, like gun control, affordable health care, job growth and climate change. Four months before Mark Kelly's fourth and final shuttle mission, his wife, Congresswoman Gabrielle Giffords, was shot in the head during a mass shooting that killed six and wounded 12 others at a public event in Tucson, Arizona. Kelly and Giffords have since been staunch proponents of gun-control legislation. In 2013, they created a political action committee called Americans for Responsible Solutions to spark a national conversation about "balanced" solutions to gun violence, or solutions that would preserve gun owners' Second Amendment rights while limiting the influencing power of the National Rifle Association (NRA). "I learned a lot from being an astronaut. I learned a lot from being a pilot in the Navy. I learned a lot about solving problems from being an engineer. But what I learned from my wife is how you use policy to improve people's lives," Kelly said in the video. After retiring from NASA to help his wife recover from the shooting, Kelly became a bit of a political activist. But that's not all this former astronaut has been up to in the past eight years. Kelly has authored several children's books, including the "Mousetronaut" series (Simon & Schuster, 2012) and "Astrotwins" (Simon & Schuster, 2016).